an urban economy based on mutual aid and cooperation is possible: A Common Resource is a resouce guide for urban needs without economic burden. is an annually published guidebook listing low-cost, sliding scale, and/or free resources for health care, childcare, food, transportation, media, and other urban needs. The resource is customized for artists and community members looking for, or in need of, low-cost alternative options. The guide also promotes alternatively structured worker-owned businesses, housing cooperatives, and resource sharing options. A Common Resource began as Alternative Resource Guide in 2012. It was the creation of Arts & Labor’s Alternative Economies Working Group. Over the long summer of 2011-2012, over a dozen members worked collaboratively researching and compiling a list of all the alternative anti-capitalistic resources available in New York City. 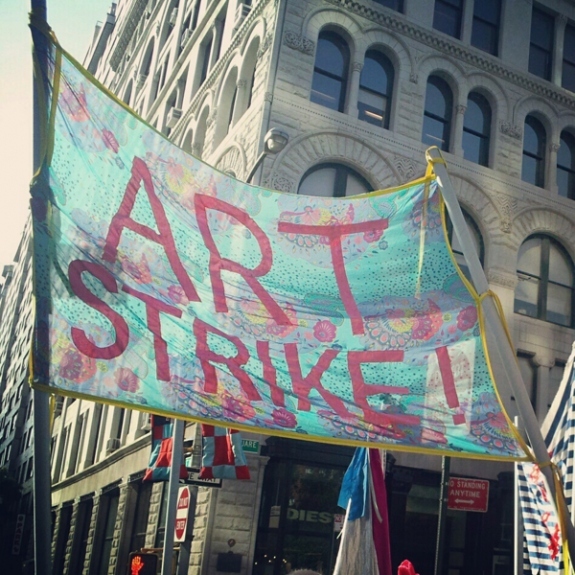 Street, Occupy Wall Street (OWS), to address the issue labor in the arts. The Alternative Economies Working Group covered broader issues related to housing, health, and general well being of artists, and also to begin to think of an alternative (art) world. The working group held various workshops in locations like Cabinet MAGAZINE, NUTUREart, Brecht Forum, NGBK, and The College Art Association, and Sunview Luncheonette. Local arts and community organizations are encourage to be distribution partners. Each local partner will receive copies of A COMMON RESOURCE to distribute to their constituents and in the community. In return we will update and print the booklets, provide local workshops, and promote partner pick-up locations.